This is a list of public packet capture repositories, which are freely available on the Internet. Most of the sites listed below share Full Packet Capture (FPC) files, but some do unfortunately only have truncated frames. This category includes network traffic from exercises and competitions, such as Cyber Defense Exercises (CDX) and red-team/blue-team competitions. Captured malware traffic from honeypots, sandboxes or real world intrusions. VM execution of info-stealer malware. Created by the Services, Cybersecurity and Safety research group at University of Twente. PCAP file with PowerShell Empire (TCP 8081) and SSL wrapped C2 (TCP 445) traffic from CERT.SE's technical writeup of the major fraud and hacking criminal case "B 8322-16". Free malware analysis sandbox. Malware samples can be uploaded or searched, PCAP files from sandbox execution can be downloaded. Online client honeypot for sharing, browsing and analyzing web-based malware. PCAP download available for analyzed sites. Shadowbrokers PCAPs by Eric Conrad, including ETERNALBLUE and ETERNALROMANCE. Network forensics training, challenges and contests. PCAP files from capture-the-flag (CTF) competitions and challenges. Note: Sniffing CTF's is known as "capture-the-capture-the-flag" or CCTF. PhreakNIC CTF from 2016 (by _NSAKEY). Contains traffic to/from the target, the NetKoTH scoring server and the IRC server. Man-in-the-Middle (MitM) attacks (a.k.a. "in-path attacks") in Turkey and Egypt discovered by Bill Marczak (read more). Over 4 GB of network forensic training data from DEEP (Digital Evaluation and Exploitation Department of Computer Science, Naval Postgraduate School). Case details can be found at Jesse Kornblum's blog. The FTP site uses rate limiting for IPv4 connections, but no ratelimit for IPv6 connections. MDSec, Packets from a GSM 2.5G environment showing uplink/downlink, two MS devices, SIM APDU information. SDN OpenFlow pcap-ng file by SDN/IPv6 expert Jeff Carrell. Joke Snelders, WiFi traffic encrypted with WPA pre-shared key (passphrase "subnet16121930", SSID "dd-wrt2"). Read Joke's "Wireshark and TShark: Decrypt Sample Capture File" blog post for decryption instructions. ANY.RUN - Interactive malware analysis service that generates PCAP files. Have We Missed Some PCAP Hive? Please send an e-mail to < info(at)netresec.com > or tweet to @netresec if you know some additional PCAP resource available on the Internet. Do you need help with web hosting of your PCAP files? Feel free to e-mail < info(at)netresec.com > or tweet to @netresec if you have PCAP files that you would like to share with the rest of the world, but need help with web hosting. We can provide a home online for your datasets, no matter how large they are. Why do we like PCAP files so much? 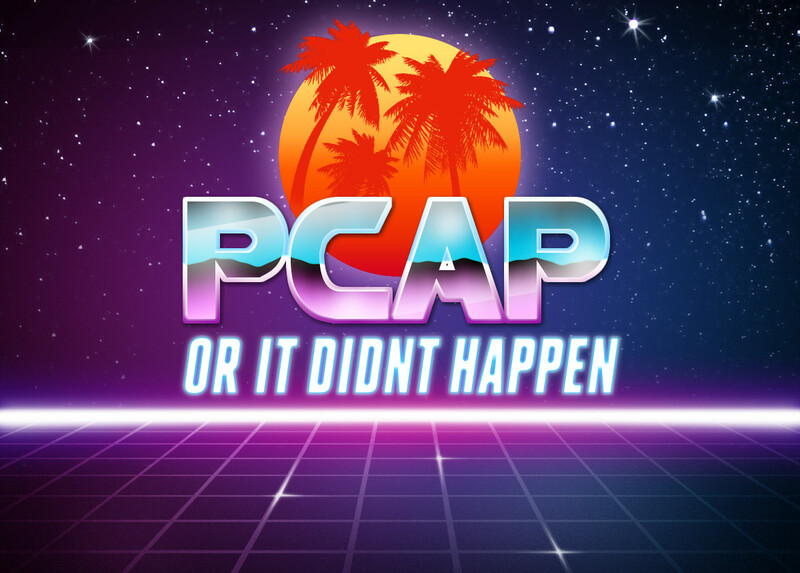 Because: PCAP or it didn't happen!